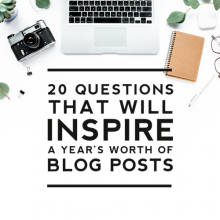 Starting a blog can sometimes be overwhelming because of all that’s involved when it comes to blogging. 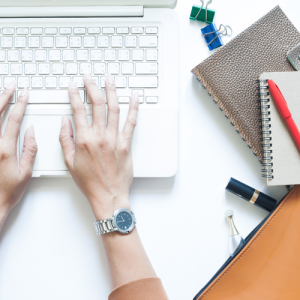 To help get you newbies started, we’ve created a list of ten important things to do when starting your blogging journey. A free printable checklist is included at the end of the post to help you track your progress and note important information. Setting goals is mentioned first because it’s one of the most important things you need to be doing as a blogger. Setting goals will help you grow your blog and will help you stay focused on the things that will help you achieve those goals. 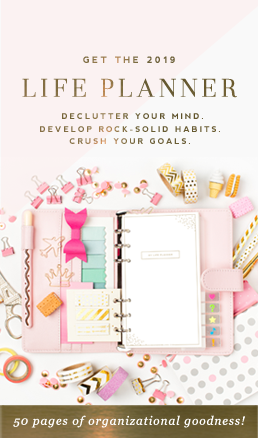 Our Ultimate Blog Planner has a collection of goal setting pages that will help you define and plan out your goals. A blog planner is a must when it comes to blogging. Blog planners help keep you organized and focused on achieving your blogging goals. Our Ultimate Blog Planner has been designed for driven bloggers who are determined to increase blog income and traffic. The full 36-page planner will help you brainstorm post ideas, plan your weekly posts, set yearly & monthly goals, track yearly & monthly stats, keep track of affiliates, Facebook advertising, social media posts, newsletter campaigns, finances, usernames & passwords, giveaways, etc. 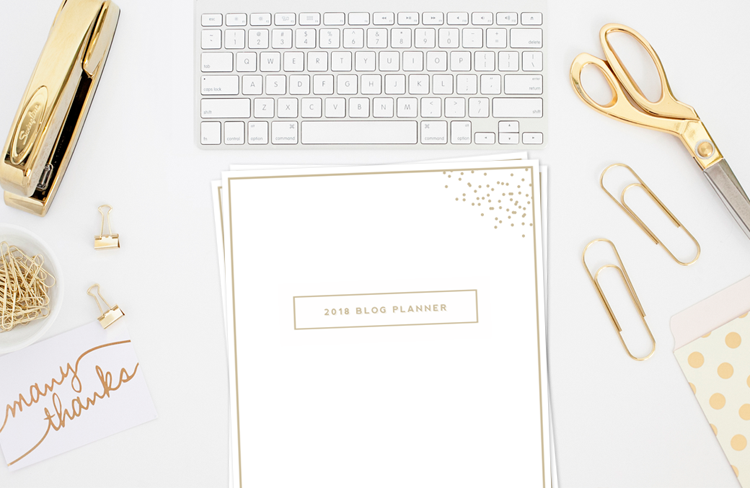 You name it, and our blog planner kit has you covered. There’s no better way to grow your blog than by strategic goal setting and regularly tracking your progress towards reaching your blogging goals. Using The Ultimate Blog Planner is key to blog organization and blogging success! Now that you have a plan for your blog and you’ve set some goals, it’s time to get your blog created. First, decide on a name for your blog and then purchase a domain. Our post 5 Blog Investment Worth Making gives you great tips on how to pick a strong blog name and domain, so be sure to review that as you are choosing your domain. GoDaddy is a great place to search for and purchase a domain. Once you have a domain then it’s time to grab a piece of real-estate on the internet. If you plan to use the WordPress platform (we highly recommend this) you can follow our How to Start a Blog tutorial which will walk you step by step through the process of purchasing hosting and getting WordPress installed. If you plan to use Blogger then you can follow our How to Use a Custom Domain Blogger tutorial for info on how to get your domain attached to your Blogger blog. 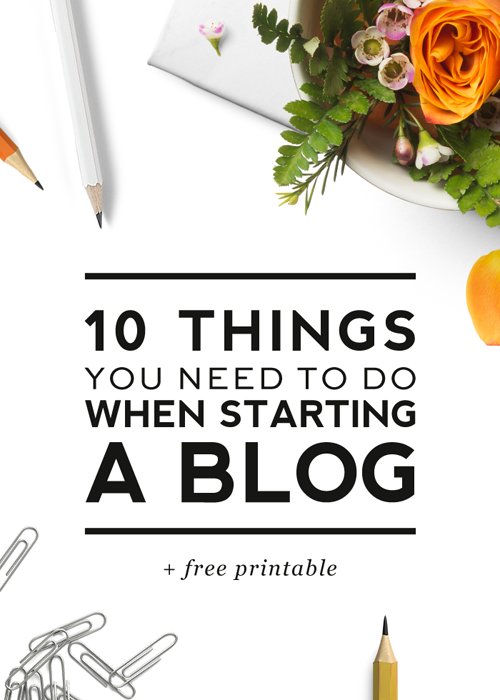 Note: you will need to have a Blogger blog set up before following that tutorial. 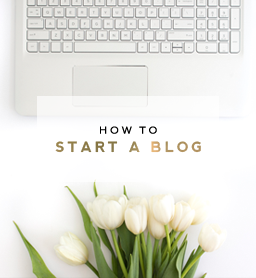 To set up a Blogger blog, simply go here and follow the steps. If you need help deciding which platform to use, be sure to check out our Blogger vs WordPress comparison. Next is to get social media accounts set up so you can start promoting your blog. Social media is one of the most powerful tools you have for growing your blog. If getting accounts set up on all of the social media outlets feels overwhelming to you, then just pick 1-3 of your favorites to start with and just focus on those. Having social media sites for your blog will help drive traffic to your blog, so this step is key. If you are looking for inspiration visit our Facebook, Instagram or Pinterest pages. If you want to grow your business or blog, you absolutely MUST make building your email list your top priority. Email is less competitive than social media which means you’ll have a greater chance of reaching people through email. Getting a mailing list in place at the beginning of your blogging journey will lead to huge profits in the future. This tutorial will help you get your mailing list set up: How to Create a Mailing List and Add Opt-ins to Your Site. 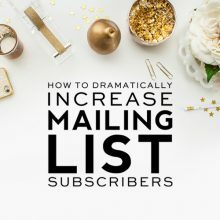 We also recommend that you read these tutorials for more info on the importance of a mailing list: Why Building a Mailing List Should Be Your Top Priority & How to Dramatically Increase Mailing List Subscribers. Once you have your blog in place, it’s important to go through your blog settings to make sure things are set up properly. Log into your blog and make sure you have added your blog title in the settings, check to make sure your comments are on. Don’t be afraid to play around with your settings to learn what things do. This would also be a good time to get some content added to your sidebar. If you are on Blogger, you’ll find our Blogger tutorials helpful at this time. If you’re on WordPress, be sure to check out WordPress tutorials for tips on getting things set up on your blog. 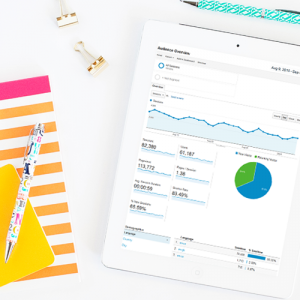 Google Analytics is a powerful tool that gives you insights on how your readers are finding your site, how they are using your site, how much time they are spending on your site, and can help you learn what your readers like so you know how to keep them coming back. It also tracks page views and how many visitors you get each day/week/month/year. 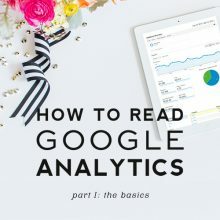 It’s important to get this installed from the get-go so be sure to follow this tutorial for instructions on how to get it set up: How to Install Google Analytics. We like to refer to your blog content as a cake. 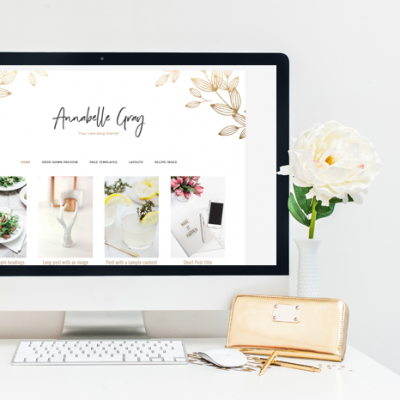 Your blog design is the beautiful icing on the cake that entices your visitors to want to delve more deeply into your content. 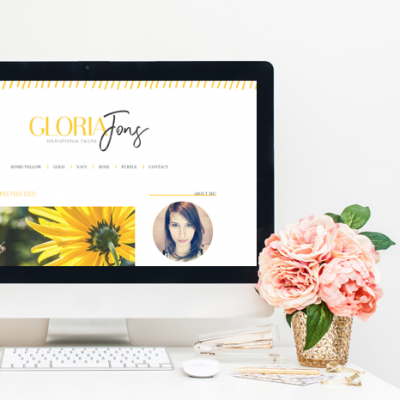 Here at Designer Blogs, we work hard to design beautiful blog designs that will help your blog attract readers. If you would like something custom created, we can do that too! Visit our custom blog design shop for more info. It’s best to get a few well-written blog posts on your blog before you announce it to the world. So spend some time creating some amazing content so your visitors will have a taste of what they’ll have to look forward to. If you are on Blogger, you can follow this post for help: How to Create a New Post in Blogger. If you are on WordPress, this tutorial will help you: How to Create a Post in WordPress. Remember to visit our WordPress tutorials, Blogger tutorials and blogging tips pages for additional info and tips on how to start and grow a blog. 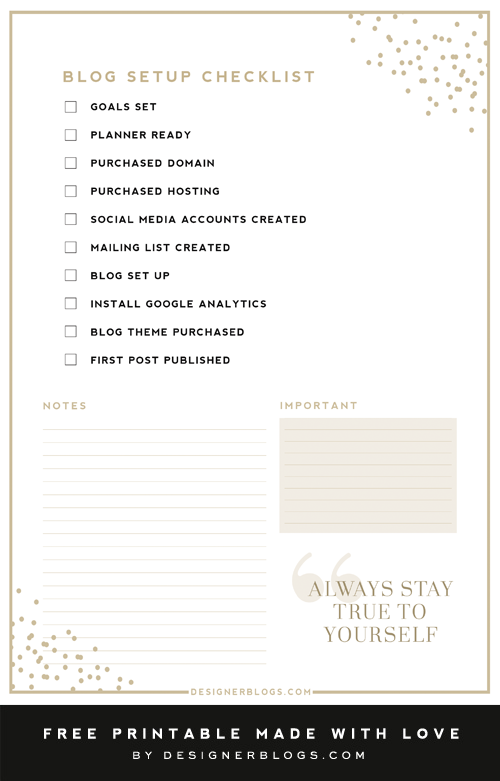 For a hard-copy list of these step to make sure you don’t forget anything, you can download and print off our free Blog Setup Checklist. Enjoy!